The banking and payments arena is now greatly influenced by mobile device adoption. Moreover, retail spend continues to migrate from the physical storefront to the online checkout, enabled in part by mobile internet usage. Money transfers, traditionally dominated by the international service operators -- such as Western Union and MoneyGram -- have been disrupted by the emergence of new fintech payment service providers. Furthermore, in emerging markets, mobile network service providers have become a key enabler of financial services inclusion. Besides, the emergence of new technologies are about to transform this market, yet again. While most of the original focus around cryptocurrency was on its usage as an alternative to fiat currencies, attention has shifted to the technologies that underpin them. It 's now believed that blockchain will have a significant role to play in the future evolution of transaction settlement solutions. 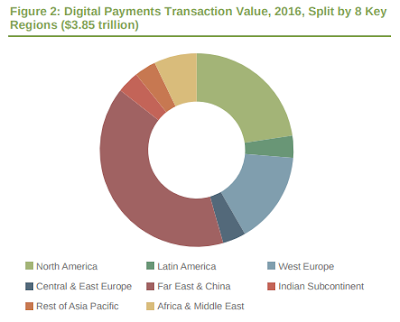 The value of digital payments will approach $3.9 trillion this year, representing an increase of more than 14 percent on last year's total, according to the latest worldwide market study by Juniper Research. While 55 percent of transaction value will be accounted for by online retail purchases for physical goods, Person to Person (P2P) money transfers will see the largest year-on-year net increase in value -- estimated at $200 million. The U.S. market would see particularly strong growth, with the bank-backed Zelle Network expected to build on its successful debut in 2016 as additional banks start to market the new service offering. The research also emphasized that the demonetization policies employed by the government in India had encouraged a surge in mobile wallet adoption, and a sharp increases in both P2P and mobile retail transactions. Meanwhile, analysts anticipate that the U.S. market will see further growth in eRetail. Online sales in 2016 were around 4 percent ahead of previous Juniper forecasts, thanks in large part to an increased emphasis by traditional bricks-and-mortar retailers in developing a converged online and offline approach. Juniper Research cited the example of Wal-Mart, which currently realizes less than 5 percent of sales through online channels, that's now seeking to boost its market share through the development of an innovation hub to help drive new retail opportunities. Furthermore, the research uncovered that the rise of chatbots and other natural language interfaces was likely to transform the consumer-facing front end, offering an improved shopper experience. However, the performance of the bot in customer service channels is critical to success. "Poorly trained bots will issue unhelpful responses, potentially resulting in customer churn away from a given brand or retailer" said Dr Windsor Holden, head of forecasting & consultancy at Juniper Research.